New rules will make is easier for farmers to use drones on their private properties. The Civil Aviation Safety Authority (CASA) has changed to the rules governing the use of commercial drones to make it easier for farmers to use them on private properties. CASA spokesperson Peter Gibson said it would reduce a lot of the red tape associated with drones. “A 25-kilogram drone is actually at the larger end of most commercially available drones at the moment. That’s a drone that can take a pretty good payload, could carry a fair bit of chemical around for crop spraying, could easily carry cameras and other gear to do visual inspections,” Mr Gibson said. Queensland farmer Wayne Chapman celebrated the announcement as the culmination of a project he led on the Western Downs in southern Queensland last year. 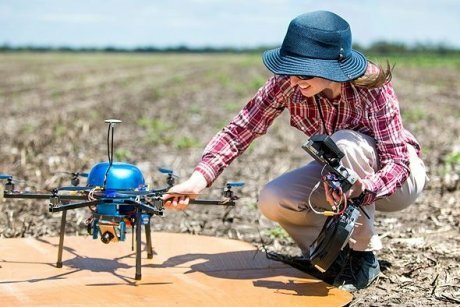 The community grant funded ‘Eye on the Sky’ project investigated the use of drones in agriculture. Mr Chapman believed drones would be a game-changer in Australian agriculture. “It’s a fantastic win for farmers working on their own land, being able to adopt some of the most exciting tools that have hit agriculture in the last 20 years,” Mr Chapman said. Mr Chapman said that while some farmers had started to dip their toes into hobby drones, the new CASA rules would give them the confidence to invest in drone technology that was tailored to agricultural use. “In one of our field days we had a guy from the Sunshine Coast that was distributing beneficial insects in horticultural fields with a drone, and he was saying it gives a much better result than doing it by hand,” Mr Chapman said. “These sorts of things are out-of-the box solutions that people will come up with,” he said. Commercial users of drones that weigh less that two kilograms will also no longer need to obtain a number of regulatory approvals, such as an operators certificate and remote pilot licence. These operators will however need to notify CASA that they intend to use very small remotely piloted aircraft for commercial flights, according to a set of standard operating conditions. “CASA will make sure there is a notification system in place so people will have to go to an online form, tell us their details, tell us what they’re going to be using their drone for, where they’re going to be using it so we’ll have a record of those people out there,” Mr Gibson said. “In terms of farmers using drones on their own properties, it is very clear in the new rules that the drones must only be used on their own properties without money changing hands,” he said. “Penalties can apply if these conditions are not met,” he said. The changed regulations take effect from 29 September 2016.